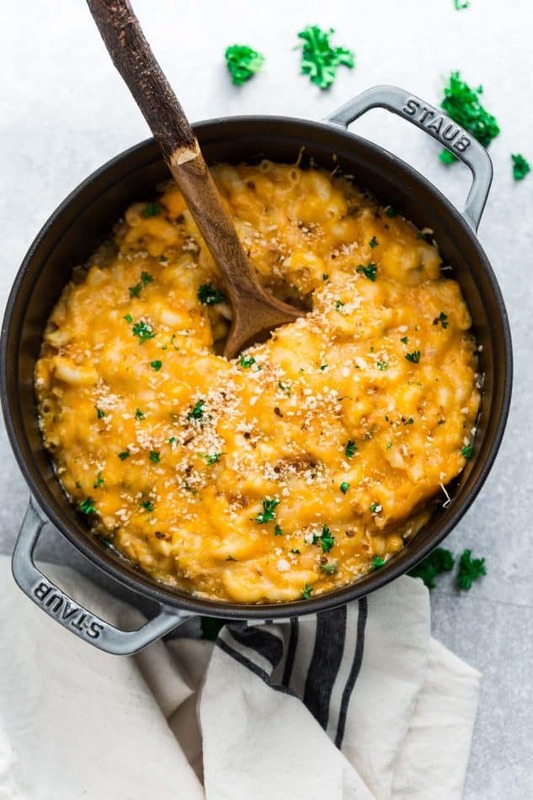 Stovetop Macaroni and Cheese is the perfect one pot dinner for busy weeknights. 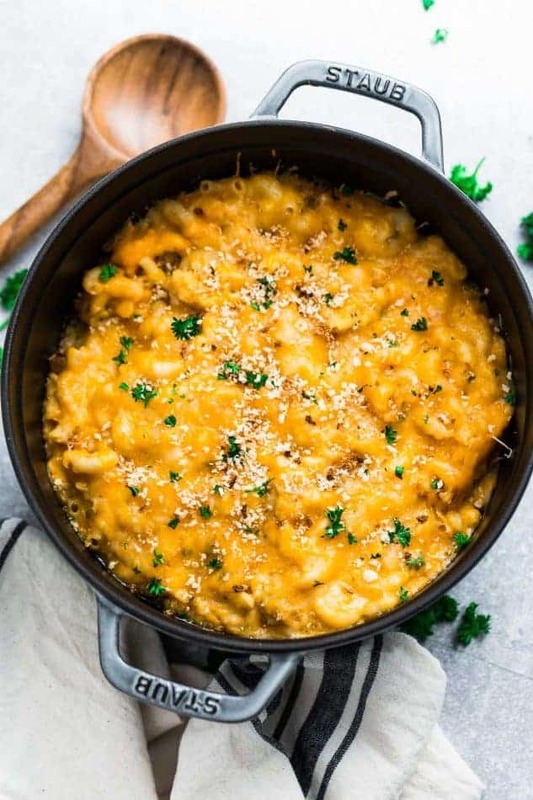 Best of all, this creamy mac and cheese is packed with 4 favorite cheeses and is ready in under 30 minutes! Plus recipe video. With fall in full swing, that means bring on all the comfort foods. For my kids, nothing screams comfort more than a creamy bowl of mac & cheese. 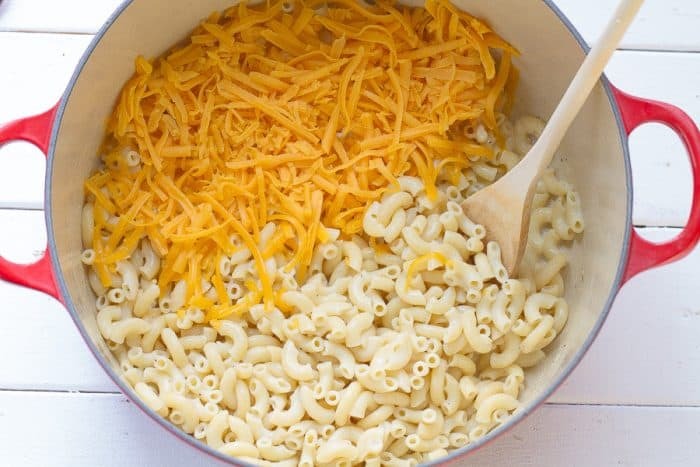 This Stovetop Creamy Macaroni and Cheese is a simple recipe that’s ready in under 30 minutes. The best part is, you can ditch the blue box version and everything cooks up on the stovetop. 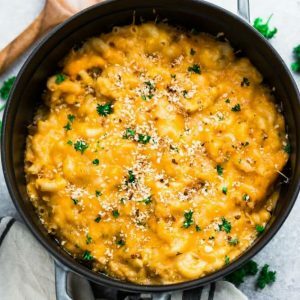 For a truly ONE POT version where the pasta cooks with the cheese, you can check out the recipe for my One Pot Macaroni and Cheese. 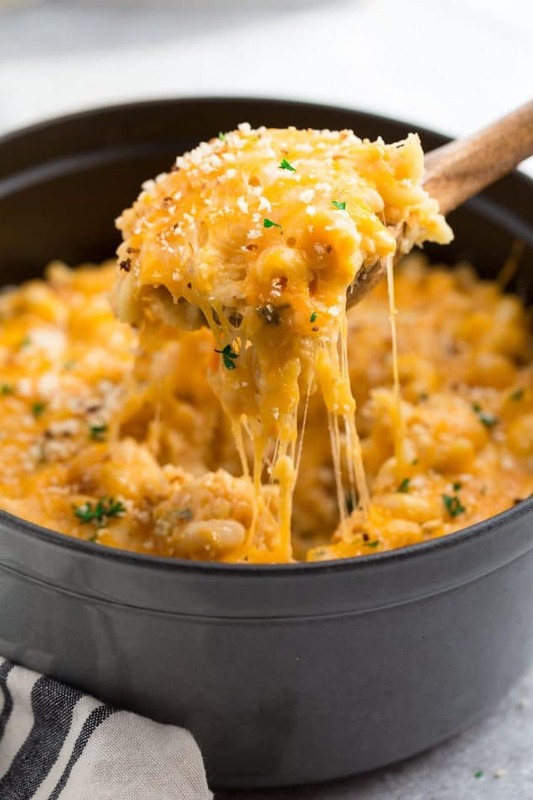 And if you prefer keeping the stove off, I’ve also got this Slow Cooker Macaroni and Cheese as well as these Instant Pot Mac & Cheese recipes. What I love about this stovetop macaroni and cheese recipe is that it’s pretty forgiving. You’re going to boil the pasta until just before al dente (about 6 minutes) and drain. Next, you add all the other ingredients into that same heavy bottomed pot or dutch oven, and stir until you get a creamy cheese sauce. Feel free to mix it up. Gruyere, Swiss, Montery Jack, gouda, Parmesan, Asiago or Pecorino would also be great! Finally, add the cooked macaroni back into the pot and stir to combine. 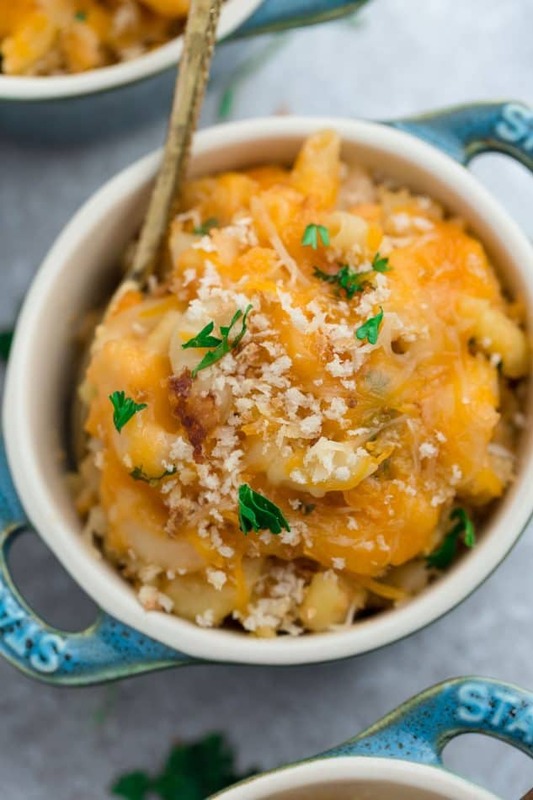 This macaroni and cheese is also the perfect vessel for cleaning out the fridge of any odds and ends you have. You can easily add in your favorite chopped vegetables or protein (chicken, sausage or bacon) to make it a complete meal. This recipe is also great for when it’s too hot to turn on your oven. Try stirring in some toasted panko crumbs for an extra added crunch. And of course, you are still totally free to bake or broil this in the oven for a few minutes if you prefer that extra crunchy baked topping. Cheesy, creamy and the ultimate comfort dish. Bring a large heavy bottomed pot or a dutch oven of water to a boil. Add the pasta and cook for 6 minutes, or until just al dente. Drain and set aside. 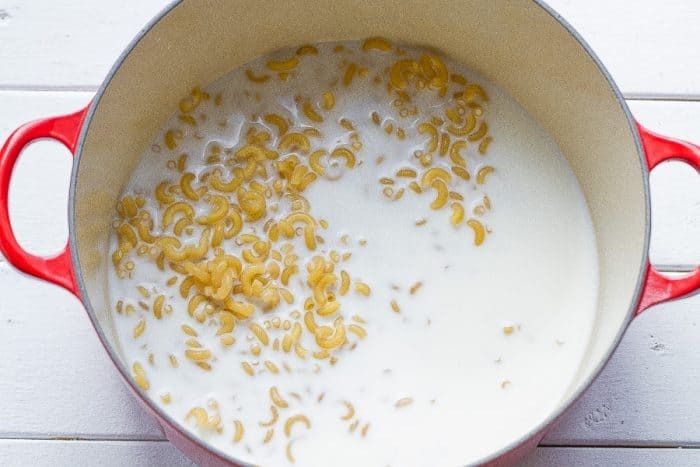 Continue to whisk in remaining milk until smooth. Then add salt, black pepper, and seasonings. Turn heat to low and stir in the cheddar, Mozzarella, and cream cheese. Add drained macaroni, top with Provolone and stir to coat evenly. Remove from heat and adjust seasonings by adding more salt, black pepper, and other seasonings to taste. Add more milk as needed for a creamier sauce.